People are rightly putting journalist Sam Pilger in his place after a truly bizarre tweet showing what looks like some serious Manchester United bias. 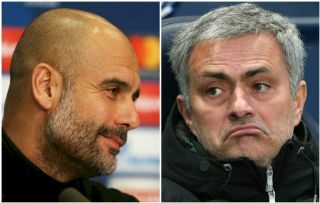 With Manchester City only managing a 1-1 draw against Wolves today, Pilger seems to be suggesting Pep Guardiola should be subjected to a ‘character assassination’, which sounds a lot like a hint at some negative coverage aimed Jose Mourinho’s way after Manchester United’s difficult start. United, let us remind you, finished trophyless last season and a whole 19 points behind Guardiola’s champions, who broke a number of records on their way to title glory. They also won the League Cup final 3-0 against Arsenal. With that in mind, fans will probably forgive Guardiola for failing to win, yes, against a newly-promoted Wolves side, but one who has a) invested a huge amount in some big names that wouldn’t go amiss in some top six squads and b) got a huge slice of luck as their goal was both offside and a handball. They also, you know, played pretty well despite the result, which is more than can be said of United against Brighton last week. Manchester City have just dropped points to a promoted team who are yet to win this season. Are we now set to see a week-long character assassination of Pep Guardiola? Going through Pilger’s tweets, he certainly seems to talk up Mourinho and United where possible, which makes this all the more embarrassing. I don't think so considering his side won the league with 100 points last season, 19 points ahead of the nearest challenger, and with a team who have a quite clear style that times out of 10, works. err no.. because his team looked like they actually wanted to win, and even created a few chances… not to mention that they are actually quite good, but do carry on! The character assassinations that happened in Pep's first season in England was unparalleled. He's proven all naysayers wrong. Proper small time tweet this. Depends whether he publicly blames his players, the chairman, the referee, or anybody else except for himself. ???? No, at least they did create chances on target in this match more than we created from the start of the session.